The strength class is designed to get you strongest you've ever been. Everyone needs a solid foundation for long term success. To do this, we start by placing everyone on our Base program. While on this program, each person will ride out a simple linear progression where week after week we make small continual increases in our 5 foundational lifts: Back Squat, Press, Deadlift, Bench Press, and Power Clean. Once the individual has exhausted this program and established a base level of strength they then move on to our Intermediate program. While on this program, things like reps and sets will switch up. You’ll add additional lifts to your repertoire and will see lifts such as Front Squats, Push Press, and Power Snatches more frequently. This program is designed to continue to build on the strength that was established in the Base program. 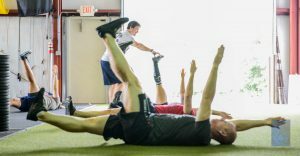 This class is intended for individuals who have goals of increasing their overall strength and power and for those who like heavier, shorter workouts.